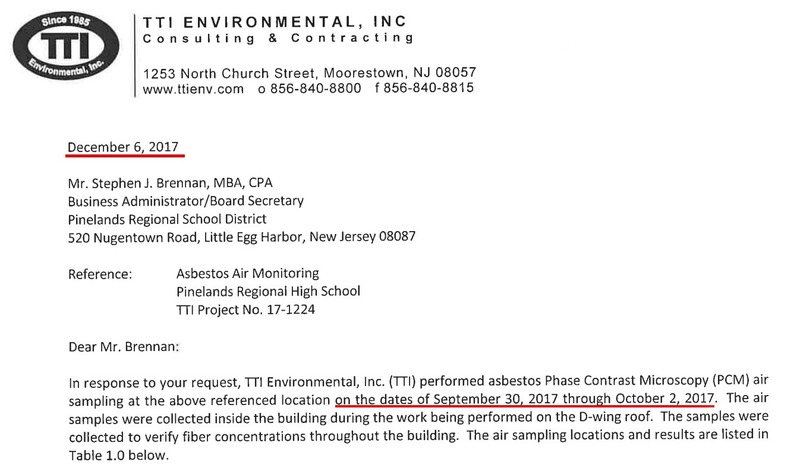 On Wednesday, December 13, 2017, Citizens’ Media TV revealed that an asbestos test was conducted in Pinelands Regional High School on the weekend of September 29th, but its results were never seen by the public. Today, December 14, 2017, that test can now be found on the district’s website. The letter is dated December 6th, but its samples were taken between September 29th and October 2nd. According to one source who attended last night’s Board of Education meeting, the test was not on the website before the meeting, but was after. [M]aybe five, six air samples [were taken inside the building] while they were doing the work [on the roof]. The PCM air samples were tested for asbestos. All those samples came back clean. In the results, however, although sixteen samples showed extremely low levels of asbestos, the remaining two came back “overloaded.” Overloaded means that the air-sampling cartridges were so clogged with dust, it was impossible for the instruments to measure. Why did it take so long for these results to be delivered? The samples were taken on the weekend of September 29th, but the letter is dated December 6th. At the October 2nd Board of Education meeting, Jim Guilardi, the author of the now-posted asbestos test, stated that “all results came back clean.” In the now-posted results, two of the 18 samples came back “overloaded.” This seems like a contradiction. Can you please respond? Finally, regarding the two overloaded results: were any dust samples taken in those locations, and where are the results of those tests? When and if we receive answers, this article will be updated.